Sovereign 4 Column Cast Iron Radiators - 5 Sections - Painted Farrow and Ball All White. 480mm tall, 330mm wide. 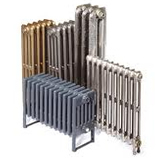 Cast Iron Radiators from our popular Traditional 4 column series - this is 480mm or 19 inches high. This cast iron radiator was introduced during the late Victorian era and has remained popular. This traditional design is both a design classic and has a very high heat output.